This is the second in a series of short essays by local individuals on what Oklahoma means to them. 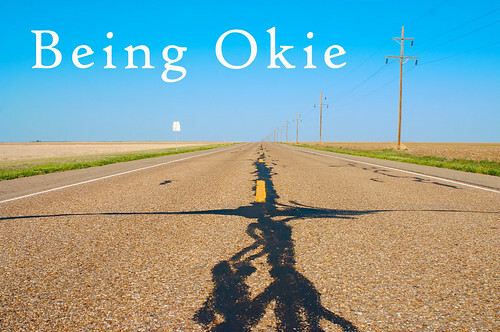 If you are interested in contributing an essay to “Being Okie,” contact us through the contributors’ page. I have betrayed Oklahoma. I no longer have its rich, red soil beneath my feet. It gave me my first home in America, and now I am half the country away. But I will be back, and I can not wait to see it again. When I moved from Britain to America for university, it was in Oklahoma that I planted my roots. Frankly, I did not hold high hopes: I knew that OU would be an interesting experience, but I never expected to fall in love with the state. I believe Oklahoma remains one of the most significantly underrated states in the nation. Today, when I tell people where I used to live, I am poised to defend against the all-too-frequent eye rolls, snorts or “Oh, God, why?” responses. Outsiders dangerously underestimate Oklahoma. I am in Boston now, which was the city my husband and I always dreamed of living in. Yet once we got here, we realized everything we had left behind in Oklahoma. I will not list the many differences between New Englanders and Oklahomans, but only summarize the greater point I wish to make: In general, Okies are good people. They are deeply kind with a down-to-earth friendliness that is endearing and genuine. I can only assume it comes from the Christian upbringing of most Oklahomans, though not exclusively, since it’s easy to be friendly when everyone around you is friendly, too. And Okies have good manners because their mothers brought them up right (which, of course, is important to me as a polite Englishwoman). But my Oklahoma is not the Oklahoma of clichés – of cowboys, churches and football (though, while I’m here: Boomer Sooner!). There is such a passionate pulse of life running through Oklahoma City and Norman that outsiders are completely unaware of. The art and music coming out of the city is incredibly exciting. The construction of new downtown housing, clubs and bars, restaurants and galleries is indicative of the new place in culture that Oklahoma is settling in to. The recent renovation of the Asian District is also wonderful: I lived in that area for a year and loved having that culture around me. “Native America”, and all that that implies, will always be crucial to understanding the state, but nowadays, there is so much more to Oklahoma. I encourage all Oklahomans to brag about it as much as possible to anyone who will listen. My husband, who was born-and-raised in Oklahoma City, and I would often drive around on those warm summer nights when having the windows down in the car felt like heaven and the smell of honeysuckle enveloped the city. He would tell me about how the neighborhoods had changed since he was young. He is always genuinely thrilled when he sees a neighborhood under renovation or a landmark being restored. And his love for the city rubbed off on me. Inevitably, we would pass the Oklahoma City National Memorial & Museum on our night drives. The repercussions of the Oklahoma City Bombing are poignant and somber. It speaks to the character of the people that life has moved on and, though people do not forget, they refuse to allow it to keep hurting the state. However, you will never hear a flippant remark or joke about the bombing, as you do about other tragic world events. I was nowhere near Oklahoma at the time of the bombing, but I feel the pain in my bones. I would be crushed if someone attacked my state again. It hurts me as much as the 2005 bombings in London broke my heart. The Oklahoma City bombing was horrific and unexpected and everyone knows someone who was directly affected. And yet, in a typically classy way, Oklahoma has a beautiful memorial and museum honoring those who lost their lives and helped rescue the victims and the city. Tragedy strikes Oklahoma far too often due to the weather. But people bounce back quickly, and when a community needs it the outpouring of support is another example of the depth of caring which is the backbone of the state. I do miss the weather in Oklahoma – not the tragedy of it, but the excitement. When I was fresh off the boat from calm-weathered England, I thought the Okies who sat on the porch to watch the storm roll in were out of their minds. Indeed, the first tornado I ever came anywhere close to left me in tears while those around me laughed heartily as it brushed past Norman. I grew to enjoy the weather events – where else is weather an “event”? I developed my own Okie compass of knowing when I needed to listen to the weathermen and when I could ignore their excited chatter. While there’s something to be said for not having danger in the clouds every day, there’s a lot more to be said for the adrenalin and electricity of an Oklahoma storm. And even though I was without power for a week during the ice storm in early 2008, I look back on it with grainy, sepia-toned images of trying to warm the cat by a candle without setting him on fire, and I love that I have that tale to tell – of ‘The Week I Lived Without Power During the Deep Mid-Winter’. I do have to say, I think politicians often betray the people of Oklahoma. There are a few leading voices out of the state who do not represent the people I know and certainly do not represent me. Some of the absurdity coming from the capitol and senators in Washington, D.C., is enough to make me want to deny my inner Sooner. While Oklahoma is a conservative state of many conservative people, I do not think it is as extreme as it may sound to outsiders because of some politicians’ loud mouths. I am hopeful for a political turn-around in the near future. Once my time in the Northeast has come to its natural conclusion, I’ll be coming home to Oklahoma. I miss it. I miss the people and the spirit. I miss the wild weather and the Wild West. I miss growing up in it and watching it grow up around me. I was not born Oklahoman, nor raised Oklahoman, but, if I had been born an American, I know in my heart that I would have been – proudly, staunchly – an Oklahoman. Lindsay Hodges Anderson is Web editor & writer for the Harvard John F. Kennedy School of Government in Boston, MA. She lived in Oklahoma August 2003 – July 2008 and hopes to return within a few years. She blogs regularly at http://britsnbobs.blogspot.com/. I can certainly empathize with you. I am not a native Oklahoman either. I was raised in western Pennsylvania. I moved to Washington DC in the late sixties to work for Uncle Sam. I met my future husband while I was there. He was nearing the end of his four years in the Navy. He was ecstatic about retuning to Oklahoma. Especially, after finding out how expensive it was to attend college in the Washington area. ($95 a credit hour v. $14 credit hour for Oklahoma residents). I was pretty clueless about Oklahoma. The one visit I made to meet my future in-laws was in the middle of one of the hottest summers in Southern Oklahoma. Co-incidentally, my husband’s father was originally from Pennsylvania. He wanted to show me a working oil well. We drove to an oil well site and I got to see a new oil well being drilled. On the way back from the tour, his car broke down. Here we are broken down on a state road. Many people stopped to see if they could help. I was astonished at the friendliness and kindness shown. Finally, we were able to call my husband’s brother to come and rescue us. We had a big wedding and most of my relatives that attended are from the eastern US. They all could not understand why in the world anyone would move to Oklahoma? At that time, I wasn’t quite sure either but I had hoped that eventually we would come back to the East. My father-in-law was prescient when he told us we would live in Oklahoma for five years and not want to move back east again. We moved to Oklahoma in the winter of 1972. I started to work for the Federal government. We lived in Midwest City about 15 miles from downtown OKC where I would be working. There was a bus that I was going to catch from our apartments. My first day of work was in the middle of one of those rare Oklahoma snowstorms. I was standing waiting for the bus when a gentlemen in a car with a little girl asked where I was going. I explained that I was waiting for a bus to downtown. He said he was driving downtown after he dropped his baby at the baby sitters and would be glad to take me. His kindness was so new to me but is typical of the people in our fair state. My son is now a NY resident getting his graduate degree and is happy to be in a state that is more in tune with his political views. He said it was so nice to see all the Obama signs and bumper stickers during the election. My husband and I get so aggravated by our elected officials that we talk of moving to a more liberal area. But then we would have to leave this beautiful state to the conservative religious, right-wingnuts. NO WAY!!! Is this a great state or what??? Lindsay, what a wonderful article. I am a native Oklahoman and have a love for this state and specifically Oklahoma City. We are maturing and growing in way that makes me proud. Thank you for your kind words. Beautiful. Well said. Thanks for sharing. I’m a native born and raised Oklahoman. Oklahoma’s top dogs are cruel to it’s large lower working class. It’s workers have no real rights in the dictatorship of the workplace. We know of Oklahoma’s shameful ranking in popular health, her low ranking in education, the low income of her masses and her well indoctrinated anti-intuitive hostility against Unionization. Her greed and profit obsessed ruling class with it’s myopic press organ spouting lies force fed popular elections on Right to Work to Oklahomans for decades until we finally got dumbed down enough to take the bate. Oklahoma reaches to the heights of national ranking in self righteous religious bigotry, in anti-intellectualism, in racism, sexism, domestic violence, homophobia and poverty. The people’s University, Oklahoma University (originally dedicated to it’s masses) has been priced out of most of it’s people’s ability to pay and given over to it’s rich and the rich of other countries. Oklahoma’s lawmakers have made the state a great prison investment opportunity for the well off and a imprisonment hell for it’s legions of poor; driven to desperate crimes of survival. While progressive cities like Portland Oregon tear down freeways to build mass trans Oklahoma’s rulers want to and probably will tear down the Capital’s rail yard to build a freeway. As the rest of the nation voted in Obama and Democratic Party representatives Oklahoma had to distinguish itself in backwardness by voting in a Republican State Legislature. A legislature that will faithfully serve the people… who have the most money. But so do her Democrats, so little difference. If you have a good job, one that pays enough to have insurance, vacations, a nice home and educations for your young Oklahoma is certainly a great place to live for you. But for the majority of it’s people that’s not the case. In Oklahoma we have a classical approach to understanding our large population of low income people and their problems: We sell them on pie in the sky and blame them, the victims, for their condition. Meanwhile the rich get richer and the only trickle down is warm and yellow. In Oklahoma we are a State that annually celebrates it’s origins (predicated by the betrayal of treaties with the Indian Nations and inaugurated by the further murder and oppression thereof) by extolling the virtues of criminals. The Sooners: People who broke the law to sneak in before the land run and full of greed stole for themselves and their progeny some of the best lands of the State. And we celebrate them! In our state we started by making hero’s out of criminals and continue the tradition to this day. Oklahoma! OK? This article nearly made me cry! I was born & raised in Oklahoma and currently reside in Norman. I love this state and I’m proud to be an ‘Okie’. Thanks for sharing your story.